Bento or also known as obento is originated from Japan. Basically, bento is a home packed lunch or lunch box. But like a lot of Japanese things, bentos are more artistic and aesthetically pleasing than typical American brown bags. Bentos are becoming popular in many countries now. Many people talk about whether bento is an art or just lunch in a box? For me, bento is a food art from tastes, textures and nutrition. Preparing bento is fun; and food preparation has becoming more and more creative simply due to food choices and fun tools. This my first attempt to prepare school bento for the kids after the long school holiday. I actually want to make a boy & a girl but finally gave up because of the time limitation in the morning and decided to make 2 boys instead for the bento. I put some carrots and baby green beans wrapped with cabbage. For the meat , it is crispy prawn/ebi katsu. The boys' face are made from the rice. I use cheese and nori to make the hair and for the cheek I use kani stick that I cut only on the red part. Eyes, nose and mouth are from nori. My kani-cheese roll is accidentally broken on the edge when I'm trying to put it on the bento box. That's okay, I will do better next time ... Put some lettuce, broccoli and flower shaped carrot for decorations (of course to be eaten as well by the kids). 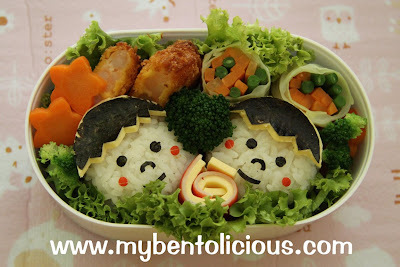 These bento food stuff is so cute.. I don't think I'd have the heart to eat this cute lil stuff.. but they're so interesting! Ya, I agree with you for their cuteness ... hehehe. And yes I do take order from overseas, which egg shapers did you mean? If you can give me the item code number, it will be very helpful for me to check the stock. Thanks Cindy!! Thanks a lot Bunda Key (it's convenient to call you that, hope it's okay hehehe ... ).